Interstate 69 currently consists as a disconnected route along a 1,660-mile corridor.12 The original segment stretches northward from Indiana to Michigan. Additional sections are posted in south Texas, the Houston area, northern Mississippi and Memphis, Tennessee, western Kentucky and southwestern Indiana. The long range goal is to unite all of the separate sections into a seamless corridor linking Canada with Mexico. Interstate 69 connects the cities of Indianapolis, Lansing, Flint and Port Huron within the Great Lakes region. The freeway begins at the Indianapolis Beltway (Interstate 465) and connects the capital city with Muncie, Fort Wayne and Angola in northeastern Indiana. The freeway serves central Fort Wayne while a beltway, Interstate 469, encircles the Summit City to the east as both a commuter route and connection to the Fort to Port Corridor, U.S. 24 leading east to Toledo, Ohio. Also in Fort Wayne, I-69 overtakes the former route of U.S. 27 north to Lansing, Michigan. Crossing into the Great Lakes State, Interstate 69 heads northerly to Marshall and a junction with Interstate 94 before bending eastward toward the capital city of Lansing. Business loops along the way serve communities bypassed along old U.S. 27. Once in the Lansing area, I-69 changes directions: A sign once indicated that I-69 north becomes I-69 east (this sign was removed by 2011). Beyond Lansing and the overlap with Interstate 96, I-69 crosses Interstate 75 at a nearly 90 degree angle within the city of Flint and then meets Interstate 475. The freeway returns to rural settings east of Flint en route to Lapeer and Port Huron. Once in Port Huron, Interstates 69 and 94 meet for a second time and combine eastward to the Bluewater Bridge to Sarnia, Ontario. The first section south of the original Indiana to Michigan route to be signed as Interstate 69 was the 14.7-mile stretch between U.S. 61 near Tunica and Interstate 55 by Hernando, Mississippi. This route generally serves as a connector for through traffic heading south to U.S. 61 and its casinos and I-55 north into Memphis, Tennessee. A subsequent extension of I-69 made in 2008 extended the route along side I-55 north into Memphis. See photos of the I-69 Mississippi ends here. Work in 2009 added 1.77 miles of Interstate 69 to southwestern Indiana. This short stretch tied into the cloverleaf interchange between Interstates 64 and 164. It was later lengthened northeast by 67 miles to U.S. 231 in 2012. By 2013, 20 miles of I-164 were redesignated as the southernmost alignment of I-69 in the Hoosier State. Section 4 of I-69 followed, with 27 more miles of I-69 opened between Crane and Bloomington in December 2015. Three parkways in Kentucky were incorporated into the route of Interstate 69, starting with the Western Kentucky Parkway between Eddyville and Nortonville in 2011, and the Pennyrile and Purchase Parkways in 2015. I-69 also shares 17-mile overlap with Interstate 24.
routes can be designated as part of the Interstate system if the route or a segment of the route meets current Interstate design standards and connects to, or is planned to connect to, an existing Interstate within 25 years. This meant that sections of freeway that will eventually become part of a seamless Interstate 69 may receive shielding in advance, even if they are disconnected from the rest of the designated mainline. 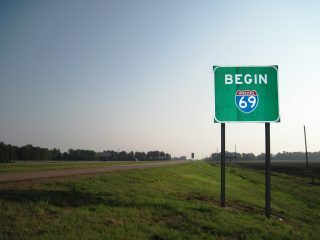 One of the first signs posted for Interstate 69 along the U.S. 59 freeway through Houston, Texas. Photo taken by Jeff Royston (09/27/12). Interstate 69 sees a lengthy alignment in southeast Texas, overlaying U.S. 59 north from Rosenberg to the Montgomery and Liberty County line. These stretches were signed over the span of three years between 2012 and 2015. They join shorter segments of the three I-69 branch routes in South Texas. I-69E, a 6.2-mile freeway between SH 44 and Interstate 37 near Corpus Christi was designated in 2011 initially as just I-69. It was renumbered as I-69E in 2013 when I-69C and I-69E in the Rio Grande Valley were dedicated. Interstate 69W appeared in 2014 when the FHWA approved a 1.4-mile stretch of Loop 20 in Laredo as an Interstate highway. Interstate 69 from Texas northeast to Michigan in its entirety is part of High Priority Corridor 18: NAFTA Superhighway. The section within Texas is also part of High Priority Corridor 20: U.S. 59 from Laredo to Texarkana. The existing section of Interstate 69 northeast of Indianapolis largely does not follow any historic U.S. route, with the exception of the stretch between Fort Wayne and Lansing. This stretch was part of former U.S. 27. When originally planned, Interstate 69 was proposed to run only between Indianapolis and Marshall, Michigan (I-94). The route was formally extended by AASHTO on June 23, 1969 north to Lansing and east to I-75 at Flint. Within Indianapolis, I-69 was proposed to continue southwest into Downtown along the Northeast Freeway. The planned route followed an alignment along former Indiana 37 (now Binford Boulevard) southwest from I-465 to the North Split interchange of Interstates 65 and 70. 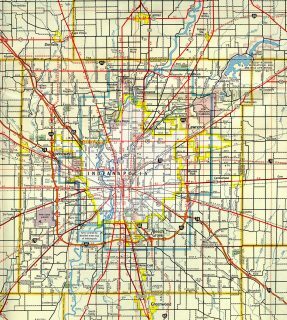 This plan was later cut back to entail just a spur southwest to Binford Boulevard proposed as Interstate 165 before being dropped altogether. Planned as a 1,250-mile extension southwest to Laredo, Texas, from Indianapolis southwest through Evansville, Memphis, Shreveport and Houston, Interstate 69 is part of High Priority Corridors 18 and 20. These High Priority Corridors are in turn subdivided into “segments” for ease of reference in various environmental and planning documents. For additional historical information, visit Chris Lawrence’s I-69 Info.com web page. 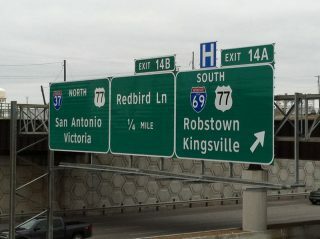 Interstate 69 began in Texas as a 6.2 mile route along side U.S. 77 between Texas 44 at Robstown and Interstate 37 at Corpus Christi with an official dedication on December 5, 2011. This portion was reclassified as Interstate 69E at the May 5, 2013 Route Numbering Committee meeting of AASHTO, because of the branch split of I-69 south from Victoria. * – 5.20 miles on I-96, # – 9.20 miles on I-55, ## – 14.00 miles on I-55, I-240 and I-40. Interstate 37 northbound reaches the north end of the first Texas segment of Interstate 69 posted. Photo taken by Jeff Royston (12/05/11). Eastbound begin sign posted on the Interstate 69 leg from U.S. 61. Photo taken 06/02/10. The first shield posted for Interstate 69 south along the Western Kentucky Parkway. Photo taken 11/07/11. A late-afternoon view of Interstate 69 in southwestern Monroe County east of the Harmony Road overpass. This section of I-69 opened to traffic on December 9, 2015. Photo taken by Thomas Decker, January 2, 2016. The Northeast Freeway leading south from Binford Boulevard by the Indiana State Fairgrounds south toward Downtown Indianapolis was dropped during the 1960s. Binford Boulevard was later expanded into a multi-lane arterial and dropped as State Road 37 when all routes within the Indianapolis Beltway were decertified. Interstate 69 will cross into Louisiana from Texas between U.S. 79 and U.S. 84 near Carthage, Texas, between Logansport and Bethany. Heading northeast, Interstate 69 will head toward Shreveport and Bossier City via Louisiana 525 (approximately), then angle roughly toward Haynesville before entering Arkansas via AR 15. It is likely that Interstate 69 will stay south of Shreveport by avoiding Interstate 20 and crossing Interstate 49 south of Shreveport. Interstate 69 will enter Arkansas just southwest of El Dorado, parallel to U.S. 63 & 167. Segment 13 connects El Dorado with McGehee. 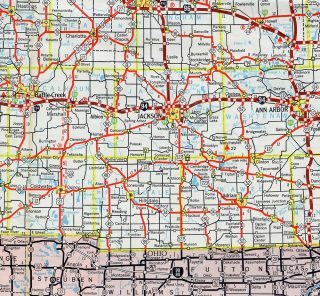 While the highway will generally parallel U.S. 63, it will utilize a new alignment. 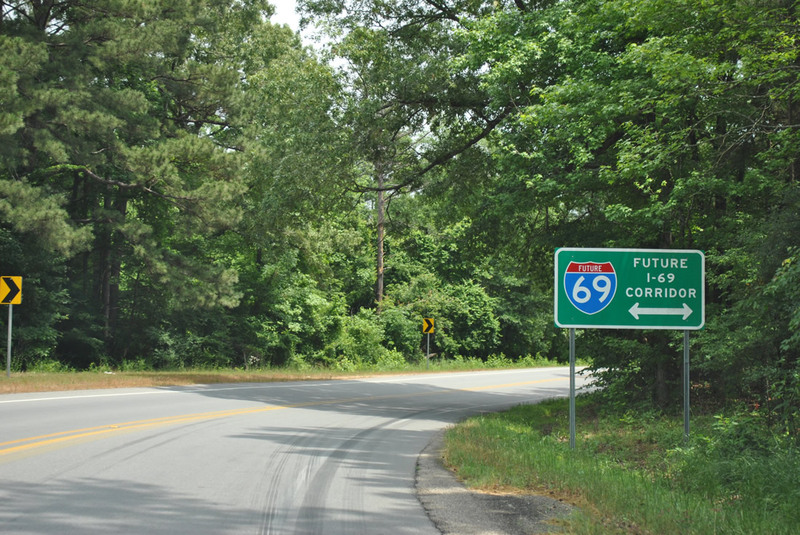 Future Interstate 69 corridor signs appear in southeastern Arkansas. This assembly resides along U.S. 278 east, three miles beyond the split with Arkansas 35 near Monticello. Photo taken 05/07/12. Segment 12 connects McGehee with Benoit, Mississippi. Segment 12 includes a new Mississippi River crossing east of McGehee. Through Arkansas, Interstate 69 will pass through Warren, Monticello and Dumas, roughly paralleling U.S. 82 and U.S. 165. A connection to Interstate 530 is planned near Monticello (since I-530 is considered part of the I-69 corridor, it has been designated as Segment 28), and this will allow for a variation on the “Dickey Split” so that I-69 has a direct freeway connection to Little Rock. Interstate 69 may also follow portions of U.S. 167, U.S. 63 (old Arkansas 15), and U.S. 278 (old Arkansas 4) between El Dorado and McGehee. The Great River Bridge is the crossing Interstate 69 will take across the Mississippi River. Planned at Rosedale, Mississippi, as a compromise location between Mississippi and Arkansas, the bridge is being designed as a four-lane Interstate-grade bridge, contingent upon Interstate 69 being constructed to the bridge. 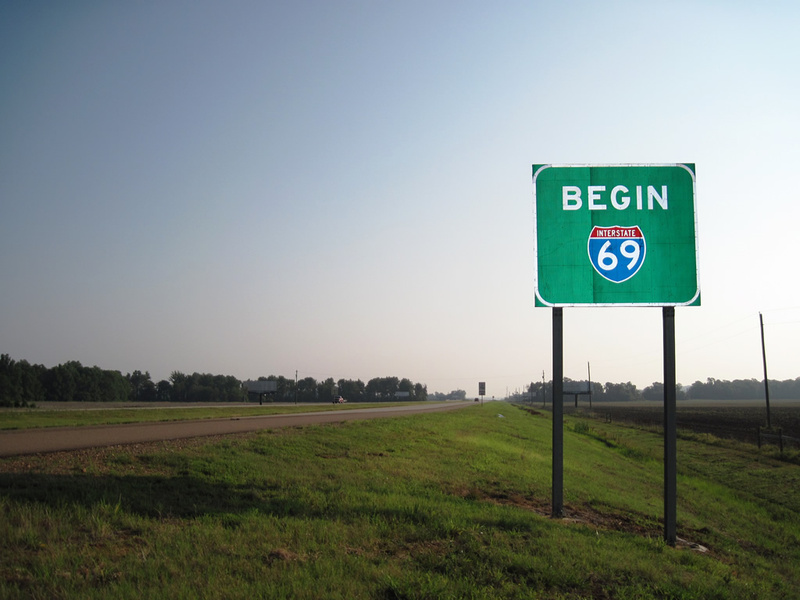 Leading away from the river, Interstate 69 will turn north along U.S. 61 toward Memphis. The section from U.S. 61 near Tunica to Interstate 55 north of Hernando opened on October 3, 2006.5 On May 6, 2008, the Interstate 69 designation was extended north on shared alignments with Interstates 55, 240 and 40 through Memphis, Tennessee, after approval by AASHTO. Signs in Tennessee however only refer to “Future Interstate 69”. Through Memphis, I-69 utilizes Interstates 55, 40 and 240 north to the Tennessee 300 freeway spur as part of Segment 9. This was the path recommended by the Memphis Metropolitan Planning Organization and the City of Memphis. A beltway route, Interstate 269, bypasses the city to the east via an alignment parallel to Mississippi 304 in DeSoto County and along the Tennessee 385 freeway between Millington and Collierville. Future I-269 signs are posted along TN 385 and a short portion is fully signed between MS 302 and TN 385 (Bill Morris Parkway). Much of the route along Interstates 55 and 40 incorporated into Interstate 69 through Memphis was improved by 2010 to carry between six and eight lanes. Beyond the Memphis belt line, I-69 will take Tennessee 300 northwest to U.S. 51, then parallel U.S. 51 to the west to Covington. The freeway will overtake U.S. 51 across the Hatchee River before shifting east of U.S. 51 around Ripley and west of U.S. 51 again to Interstate 155 & U.S. 412 at Dyersburg. This alignment is a part of Segment 8. Segment 7 entails the corridor from Dyersburg northeast to Union City and South Fulton. A new alignment is currently under construction for Interstate 69 from Union City that will connect directly to the Julian M. Carroll Purchase Parkway.3 Additionally, the Tennessee 22 freeway is proposed to extend west to meet Interstate 69 and possibly become a spur route: Interstate 169. Interstate 69 will continue along U.S. 51 north to the Julian M. Carroll Purchase Parkway connection at Fulton, Kentucky as part of Segment 6 (Fulton north to Eddyville). Interstate 69 follows the Purchase Parkway from Kentucky 166 until its end at Interstate 24. 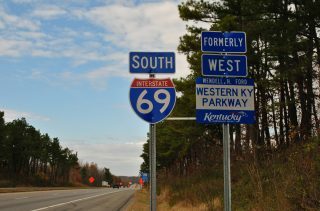 Between 1991 and 1999, it appeared as if Interstate 69 would be constructed on a new alignment from the parkway terminus northeast to Henderson, Kentucky. However, in May 1999, the state of Kentucky announced that Interstate 69 would follow the existing Wendell Ford/Western Kentucky Parkway and Breathitt/Pennyrile Parkway (Segment 5, from Eddyville to Nortonville, and Nortonville to Henderson). Future Interstate 69 signs were posted along these preexisting freeways and on October 18, 2011. The Purchase Parkway was formally established as Interstate 69 by AASHTO on May 15, 2015. This covered the 50 mile stretch from Kentucky 166 at Fulton northeast to Interstate 24, south of Calvert City. 38 miles of Interstate 69 were previously approved by AASHTO for the portion of I-24 leading east from the Purchase Parkway to the Western Kentucky Parkway, and along the WK Parkway east to the Pennyrile Parkway. Interstate 69 incorporated 20.70 miles of former Interstate 164 when it overtook the alignment north from U.S. 41 to Interstate 64 as approved by AASHTO on October 21, 2013. 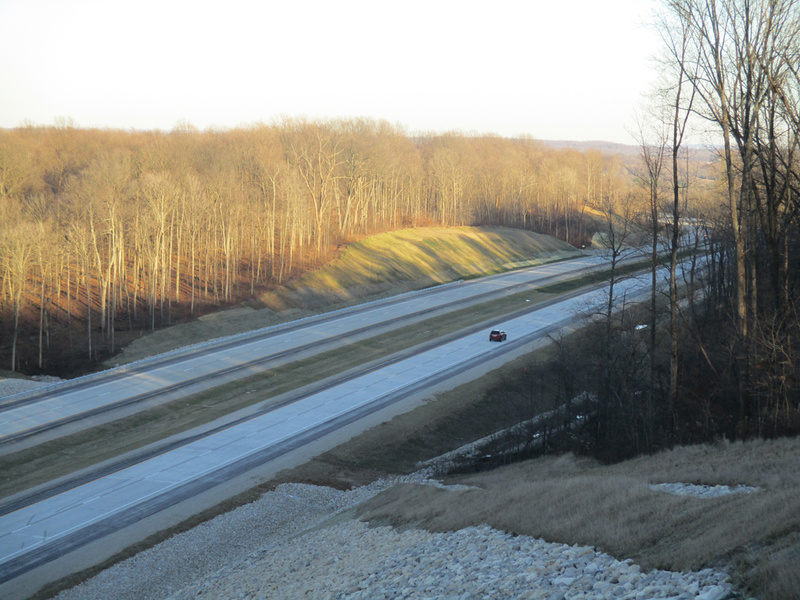 This tied into a previously completed 1.77-mile segment of I-69 between I-64 and Indiana 68. Groundbreaking for that portion was held during the week of July 14, 2008, in Gibson County.6 It replaced Indiana 57 to the west between the cloverleaf interchange at I-64 and IN 68 when it opened on October 1, 2009. Continuing north from there along new alignment, Interstate 69 serves Oakland City, Petersburg, Washington and Crane. Accelerated by INDOT’s “Major Moves” initiative funded by the leasing of the Indiana Toll Road, the 67-mile stretch opened between SR 64 and U.S. 231 near Crane Naval Surface Warfare Center on November 19, 2012. The new Interstate 69 will reconnect with existing Interstate 69 at Indianapolis via a shared alignment with Interstate 465 along the south and east sides of the city. Exit numbers along the original Interstate 69 from Indianapolis (Interstate 465) northward to Michigan were renumbered in August-October 2012 to account for the additional mileage gained from the Evansville to Indianapolis stretch underway. To simplify things, INDOT increased all existing exit numbers by 200 while the actual mileage gain is estimated at 184 miles. Much of the information regarding the Interstate 69 extension in Indiana was researched from The Indianapolis Star. Eastbound Interstate 94 at Interstate 69 West and Business Loop I-69 East in Port Huron. Interstates 69 and 94 merge for the final distance toward the Blue Water Bridge. Photo taken by Jim Teresco and Rob Foulis (06/27/01). Traveling east on Interstate 69, the freeway prepares to split at the junction with Interstate 94. The first exit departs to Interstate 94 southwest to Detroit, while the next exit is Business Loop I-69. The business route travels east along Oak Street/Griswold Street couplet to Port Huron. The left lane connects Interstate 69 east to its shared alignment with Interstate 94 en route to Sarnia, Ontario. Photo taken by Jeff Morrison (06/25/07). The final standalone exit along eastbound Interstates 69 and 94 is Exit 274, Water Street (using the exit numbering for Interstate 94). After this interchange, the freeway approaches its eastern terminus, where the freeway splits between the exit to Canada via the Blue Water Bridge or to Michigan 25 north to Port Austin. A major reconstruction of Interstates 69 & 94 was underway in 2011 between Exit 274 and the Blue Water Bridge approach. The wye interchange to Lapeer Road (Business Loop I-69) was reconfigured into a diamond interchange to provide eastbound access. Photo taken by Jeff Morrison (07/01/07). Approaching the off-ramp to M-25 (Pine Grove Avenue) along Interstates 69 & 94 east. A new bridge was constructed for the freeway over the Black River during 2011-12 construction and the forthcoming wye interchange to Pine Grove Avenue (former U.S. 25, decommissioned in 1972) was reconfigured to change the left-hand ramp to the right-hand side. The Blue Water Bridge provides connections to Ontario 402 and Sarnia. Photo taken by R. Bruce Telfeyan (07/24/04). Eastbound Interstates 69 and 94 reached their joint eastern terminus at this interchange, where the freeway split between the Blue Water Bridge east and Michigan 25. This photo is historical in nature due to the redesign of the unnumbered exit to M-25 in 2011-12. Photo taken by Jeff Morrison (06/25/07). M-25 (Pine Grove Avenue) sees a loop ramp onto the Blue Water Bridge from juts north of Elmwood Street. The road that used to be U.S. 25 continues straight ahead; Michigan 25’s end was signed a block to the north. Photo taken by Jeff Morrison (06/25/07). The transition from Interstate 69-94 eastbound to the Blue Water Bridge is a maximum of three lanes in each direction, with lane signals to regulate flow and traffic control. This picture shows the eastbound transition from Interstate 69-94 onto the bridge. Photo by R. Bruce Telfeyan (07/24/04). The Blue Water Bridge carries international traffic between the eastern end of Interstates 69 and 94 and the western end of Ontario Route 402. Photo by Eric Vander Yacht (05/01). Interstates 69 and 94 terminate just prior to crossing the Blue Water Bridge near Port Huron. North of the Blue Water Bridge, there are no other crossings of the Great Lakes until reaching the Mackinac Bridge along Interstate 75 between Mackinaw City and St. Ignace. Photo by John Harmon (02/01). The Blue Water Bridge connects directly to Ontario 402 and the city of Sarnia. Ontario 402 meets Ontario 401 near London, and Ontario 401 continues northeast toward Toronto and Montreal. Photo by Eric Vander Yacht (05/01). Upon reaching the mid-point of the bridge, this marker indicates the actual boundary between the United States/Michigan and Canada/Ontario. This plaque was placed by the International Boundary Commission, and it is bilingual (English and French). Photo by R. Bruce Telfeyan (07/24/04). The historic westbound beginning of Interstate 69 at the point where Michigan 21 would have turned into Interstate 69 (Exit 136 now). Crossing bridges are ramps between Interstate 475 and 69. Photo taken 11/06/11. An overpass near the intersection with Interstate 475. First, note where the I-beam marks are — that is where a sign that had two Michigan 21 signs and the words Lapeer and Port Huron once hung. Second, the Interstate 475 sign to the right only had the word Detroit showing before 1984, as the portion north of Interstate 69 was not completed before 1984. Photo taken 11/06/09. The historic eastbound ending of Interstate 69 at the point where Interstate 69 would have turned into Michigan 21. Crossing bridges are ramps between Interstate 475 and 69. Photo taken by Don Hargraves (11/02). First sign of the interchange with Interstate 69 (now Exit 6). Until 1984, the sign would have also displayed Michigan 21, and to the left of the height sign was a sign that displayed “highway ends 3/4 mile.” Photo taken by Don Hargraves (11/02). The location where traffic from Interstate 475 south would have exited onto eastbound Interstate 69/Michigan 21 and westbound Michigan 21; now just Interstate 69. Before 1984, Court street would have been known as Michigan 56 and all traffic would have had to exit off at that road. Interstate 475 north of Court Street was not open until 1984. Photo taken by Don Hargraves (11/02). All traffic to Interstate 69 departs in unison from underneath the Court Street overpass via Exit 6 of Interstate 475 south. This stretch of Interstate 475 post dated the extension of Interstate 69 east to Port Huron. Photo taken 11/05/09. The northern split between Interstate 96 west and Interstate 69 north (which becomes east). Interstate 96 travels 55 miles to Grand Rapids as Interstate 69 straddles the north side of Lansing en route to Flint, 55 miles to the east. Photo taken by Don Hargraves (11/02). Updated overheads posted at the Exit 91 three wye interchange between Interstates 69 and 96. Omitted from new signs is Exit 90 with Business Loop I-94, which follows Grand River Avenue east from the three wyes into Lansing. Photo taken 11/05/11. Reassurance shield for Interstate 69 North after it departs from Interstate 96 west. 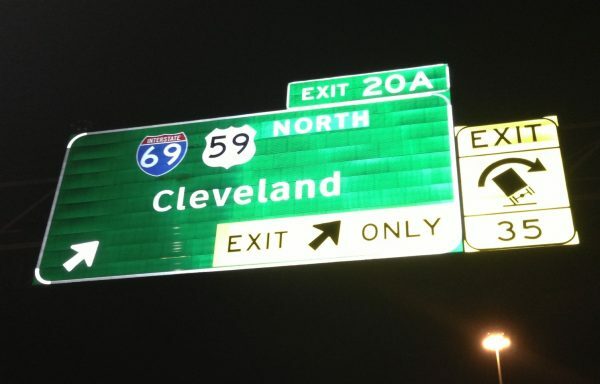 This is an oddity as I-69 is intended to carry east/west cardinal direction banners by this point. Photo taken 11/05/11. Interstate 69 is finally signed with an east cardinal direction banner one third mile or so after the merging of the ramp from Interstate 96 eastbound. Originally there was a sign here displaying “North 69 becomes East 69.” Photo taken by Don Hargraves (11/02). This sign came down by June 11, 2002. Additionally on the section of I-96 westbound overlapped with I-69 north, new signs posted around this time referenced I-69 as traveling east.1 Photo by Eric Vander Yacht (05/01). Interstate 69 westbound reassurance shield, posted before the six mile overlap with Interstate 96. Photo taken 11/05/11. This stretch of roadway and reassurance shield represents the direction change of Interstate 69 from westbound to southbound. Interstate 96 has yet to merge as the eastbound lanes of it are parallel to Interstate 69’s westbound lanes at this point. A sign originally was posted here that displayed “Interstate 69 west becomes Interstate 69 south.” Photo taken by Don Hargraves (11/02). The one mile advisory sign to the end of Interstate 69 coincides with the Indianapolis control city. Indiana 37 continues south along Interstate 465 via Exit 200. Eventually I-69 will do the same to its eventual alignment southwest from the capital city to Evansville. Photo taken by Thomas Decker (02/06/12). Reconfiguring of the Exit 200 ramp to Interstate 465 increased the lane total from two to three. The Interstate 69 mainline defaults onto Binford Boulevard (former Indiana 37) otherwise with two lanes. First photo taken by Thomas Decker (02/06/12). Beyond the Exit 200 gore from Interstate 69 (and the Binford Boulevard connection), the split of the ramps to Interstate 465. Both ramps now carry two lanes onto the Indianapolis Beltway. Photo taken by Thomas Decker (02/06/12). Travelers remaining along the ending Interstate 69 pass under Interstate 469 and see a Freeway Ends sign and a set of flashers. Binford Boulevard begins at a forthcoming traffic signal located at 75th Street. The boulevard constitutes a surface street with near-expressway standards southwest into downtown Indianapolis. Photo taken 10/16/04. For additional photos see the Interstate 69 South – Madison, Hamilton & Marion Counties highway guide. North of 71st Street is the first exit sign for the oncoming freeway. Interstate 465 is one mile north of here. Photo taken by Brian Dowd (11/29/02). The final stoplight of Binford Boulevard is for 75th Street; Interstate 69 commences ahead. Photo taken by Brian Dowd (11/29/02). Just shy of the 200 mile-marker for Interstate 69 are these guide signs attached to the flyover ramp from Interstate 69/S.R. 37 southbound to Interstate 465 southbound supporting signs for the first two exits of Interstate 69: Interstate 465 east and 82nd Street. Photo taken by Brian Dowd (11/29/02). The loop ramp onto Interstate 465 west is unnumbered from the beginning of Interstate 69 north. Photo taken by Brian Dowd (11/29/02). This was the first in the series of Interstate 69 related signage, posted 1.75 miles south of Exit 37. The overhead was removed as Interstate 465 northbound was expanded to four lanes between May and November 2002. Note that the ramp was originally signed as Exit 37B, though Exit 37A was never constructed onto Binford Boulevard southbound. Photo taken by Brian Dowd (05/31/02). Leaving the confluence with Shadeland Avenue along Interstate 465 northbound at Fall Creek. The directional-cloverleaf interchange with Interstate 69 & Indiana 37 north follows in 1.5 miles. Indiana 37 shares pavement with I-69 from I-465 to Fishers. Photo taken by Chris and Amber Lokken (04/07/08). One mile out from the Interstate 69 northbound beginning along Interstate 465, U.S. 31-52-421 and Indiana 37 northbound. When Interstate 69 is extended south along the beltway to Bloomington, the upcoming interchange will represent the northbound split of Interstates 69 and 465. Photos taken by Chris and Amber Lokken (04/07/08). Interstate 69 travels 22 miles northeast from Exit 37 to Anderson. Photo taken 07/31/09. Two lanes carry motorists from Interstate 465 north onto Interstate 69 & Indiana 37 north to Fishers, Fort Wayne and Lansing, Michigan. Photo taken by Carter Buchanan (07/31/09). Two miles west of Interstate 69 & Indiana 37 north along Interstate 465 east (inner loop). Road work to widen the beltway to the White River saw completion in 2011. Further widening and a reconstruction of Exit 37 with I-69 was completed during the 465/69 Northeast project. Photo taken Thomas Decker (12/17/11). 465/69 Northeast road work reconstructed Exit 35 with Allisonville Road into a single point urban interchange (SPUI) in 2012. Interstate 69 is the next exit. Photo taken Thomas Decker (12/17/11). Presently a directional-cloverleaf interchange joins Interstates 465 and 65 at Exits 37A/B. 465/69 Northeast road work will drastically change this junction with the addition of a new high-speed flyover from I-465 east to I-69 north, with segregated movements between the Interstate 69 mainline and the nearby East 82nd Street interchange. This photo shows the original three lane mainline of I-465 east, a half mile out from the Binford Boulevard (former SR 37 south) off-ramp. Photo taken by Chris and Amber Lokken (06/23/08). Eastbound Interstate 465 reaches Exit 37A, Binford Boulevard (former Indiana 37) south. When the state road was relocated from within the beltway in the late 1990s, its alignment was renamed Binford Boulevard. 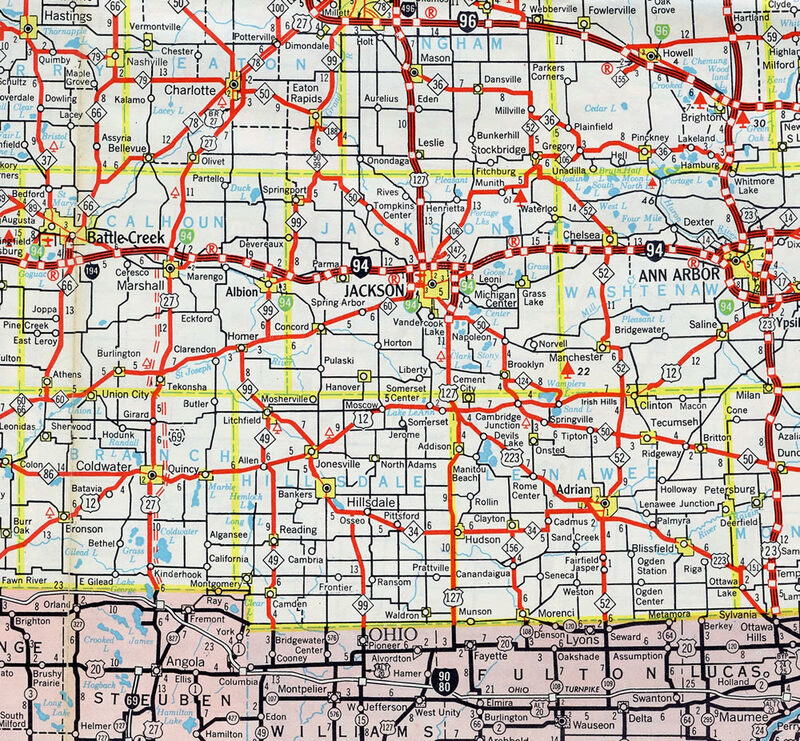 Had Interstate 69 continued southwest along the planned Northeast Freeway, it would have followed the route of Binford Boulevard to Falls Creek Parkway. 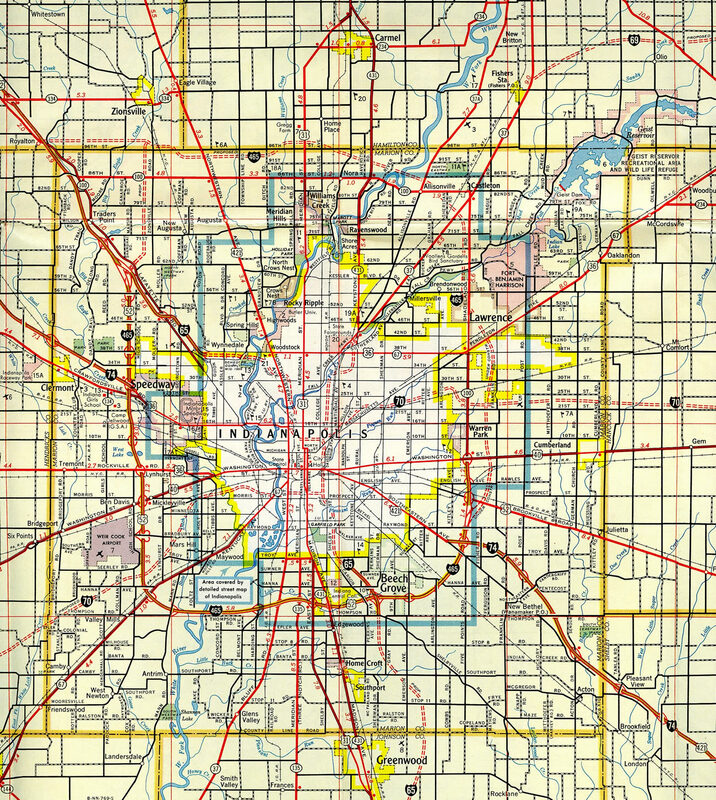 This was outlined on the 1968 Indianapolis Transportation Plan. Photo taken by Chris and Amber Lokken (06/23/08). Immediately thereafter, eastbound Interstate 465 (inner loop) reaches Exit 37B, Interstate 69 and Indiana 37 north to Fishers and Fort Wayne. “Major Moves” focuses on a southwest extension of Interstate 69 from the capital city to Evansville, and over 80 miles of freeway will be open to traffic by the end of 2012, linking U.S. 231 near Crane with Interstates 64-164 near Evansville as new I-69. Interstate 69 will follow the beltway south and west to a new interchange west of SR 37 to make the trek south from Indy. Photo taken by Chris and Amber Lokken (06/23/08). For additional photos from this perspective see the Interstate 465 Inner Loop (Speedway to Castleton) guide. “Kentucky may see signs of I-69.” Evansville Courier & Press, September 2, 2011. “Interstate roads have shaped the future for many mid-Michigan communities,” Lansing State Journal. July 23, 2006, By Christine Rook and featuring Michigan Highways creator Chris Bessert. “KYDOT District Engineer Presents Road Work Updates.” SurfKY News Media. October 17, 2013. “INDOT: Next section of I-69 to open by end of year.” Evansville Courier & Press May 26, 2015. “‘New’ Interstate 69 may look familiar – Well, it should be because it’s also part of U.S. 59 ” Houston Chronicle, March 27, 2015. “Signs, signs, everywhere 59 and 69 signs” The Highwayman – Transportion in Houston with Dug Begley, March 28, 2015. Interstate 69 (I-69) Texas to Michigan – Corridors of the Future Fact Sheet, Federal Highway Administration. “Stretch of Pennyrile Parkway in Western Kentucky upgraded to I-69.” The Lane Report, November 16, 2015. “SH 44 Added to Congressionally Designated I-69 Corridor.” Alliance for I-69 Texas web site, December 5, 2015. “Flint Freeway Finished Dec. 21.” The Owosso Argus-Press, December 4, 1971. “Indiana pays over $184M for properties along I-69 route.” News-Sentinel (Fort Wayne, IN), April 5, 2016. “Section of I-69 extension won’t be complete until June 2017.” Daily Herald (Arlington Heights, IL), April 13, 2016. “I-69 Section 5 project pushed back again.” Evansville Courier&Press, September 21, 2016. Page updated October 18, 2016.